Dust ruffle, bed skirt... whatever you call it, you need one on your baby's crib. It's cute and most importantly it will hide all of your tubs of toys, clothes and diapers. It was a lot of work and I decided never to do that again. I was waiting until the day I got a serger to do another dust ruffle but then I discovered overcasting and the overlock foot (thanks Janelle!). It stitches over your edges so they look finished and don't ravel. Or unravel. Whatever the word is. Some machines come with one but I had to order mine. It doesn't trim the fabric like a serger but it gets the job done! So I just finished a new crib skirt and will be using the pictures of it for this tute. Cut your 2 yard panel fabric into three equal 2 yard strips (they should each be about 14.5" high - this is your skirt length). Cut the strips into six 9.5" wide pieces (USE THESE FOR SHORTER PANELS) and eight 13" wide pieces (USE THESE FOR LONGER PANELS). You will have fourteen pieces total. 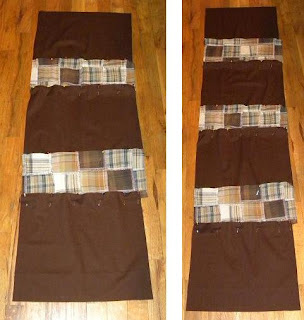 Cut your 1 yard of pleat fabric into three equal 1 yard strips (they should be about 14.5" each - this is your skirt length). Cut the strips into ten 7.5" wide pieces. If you need to trim the bottom make sure you used a ruler so you cut it straight. Now to hem along the bottom just fold 1/4" then iron, fold another 1/4", iron again, then sew. Hem each end the same way. Now get out your cheap fabric and cut it to 53" X 29". Find the center of each side either by measuring or folding it in half and place a pin at the center on each side's edge. Do the short panels first. Line up the centers of the cheap fabric and the panel and pin the unfinished edges right sides together at the center. Now to make your pleats! Starting on the side closest to the center of the panel and working your way out, pull pleat fabric up out of the way and place panel fabric pieces directly next to eachother so the pleat fabric is... well, "pleated". Now lay pleat flat and pin along the unfinished edge AND pin the bottom of the pleat to help keep it in place while you sew. You could even put one more pin in the middle to hold it even more. Iron them flat. EDITED TO ADD: When you sew the short panels on, they will end 1/2" before the edge on both ends. I did it this way on purpose so that the long panels will line up perfectly, edge to edge, with the cheap fabric. Do all 4 sides, iron pleats flat and that's it! Please ask any questions you may have and show me your bed skirt if you use my tutorial for it!